Edward A. Michelson, M.D., has been named the 2018 Editorial Board Member of the Year by the Western Journal of Emergency Medicine. Dr. Michelson is an associate editor of the journal. 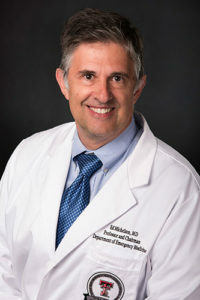 Dr. Michelson is professor, chair and program director of Texas Tech University Health Sciences Center El Paso’s Department of Emergency Medicine. Dr. Michelson received his medical degree from Washington University School of Medicine in St. Louis, Missouri. He trained at Northwestern University in Chicago, Illinois, and is board certified in internal medicine and emergency medicine. Prior to coming to El Paso, he was the founding chairman of the department of emergency medicine at Case Western Reserve University/University Hospitals Cleveland Medical Center in Cleveland, Ohio.